On the Sidelines – Premiere Episode! 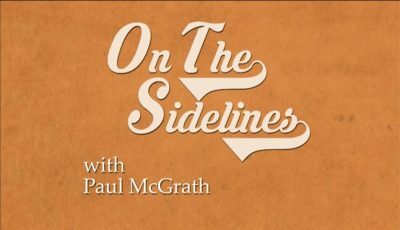 Join us for Westborough TV’s newest show hosted by Paul McGrath – “On the Sidelines.” In this sports show, Paul discusses all things sports and how sports can affect our lives. Whether it’s baseball, auto racing, hockey or football, sports is a big part of life here in America, and Paul gives us sports guests who have a unique story to tell! Watch the first episode with featured guest, New England Auto Racing Hall of Famer, George Summers. 6 Responses to On the Sidelines – Premiere Episode! The link to watch it online is not working! So sorry! We had a small audio issue and had to re-encode. The link on the page should now work. Enjoy! Paul is a natural born host and he had a great first guest! Excited to see the premiere episode! However, the above link is not working. Your newest host, Mr. Paul McGrath is a natural. Warm, welcoming and well-informed. He puts the guest at ease and encourages open dialogue with facility. I can’t wait to see more of this enlightening show! Paul McGrath is exceptional in providing a wonderful sports program to all of the viewers! A natural with great instincts on asking the correct questions. Great job Paul!!!! Looking forward to more great sports programs.